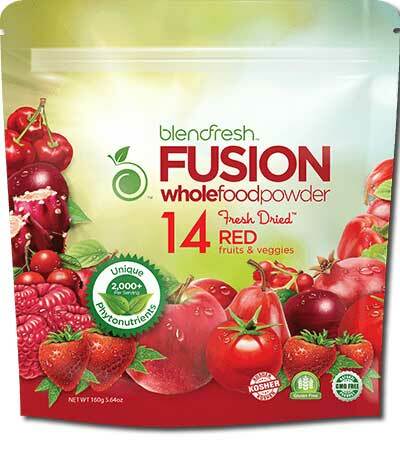 Blendfresh raw, whole-food Fruits & Veggies blends are the closest thing to fresh picked. Adding whole-food fruits and vegetables has never been easier. 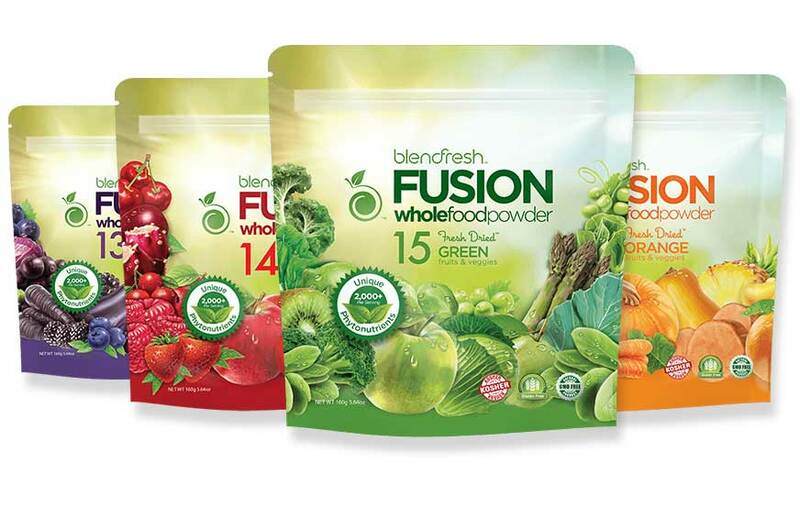 Blendfresh blends are the first and only raw, whole food formulas combining a diverse selection of fruits and vegetables through a unique Fresh Dried process. All ingredients are also pesticide-free, GMO-Free, unprocessed, and 100% Natural. Nothing artificial, zero preservatives, and no soy, dairy or eggs. Nothing but Fruits and Vegetables. 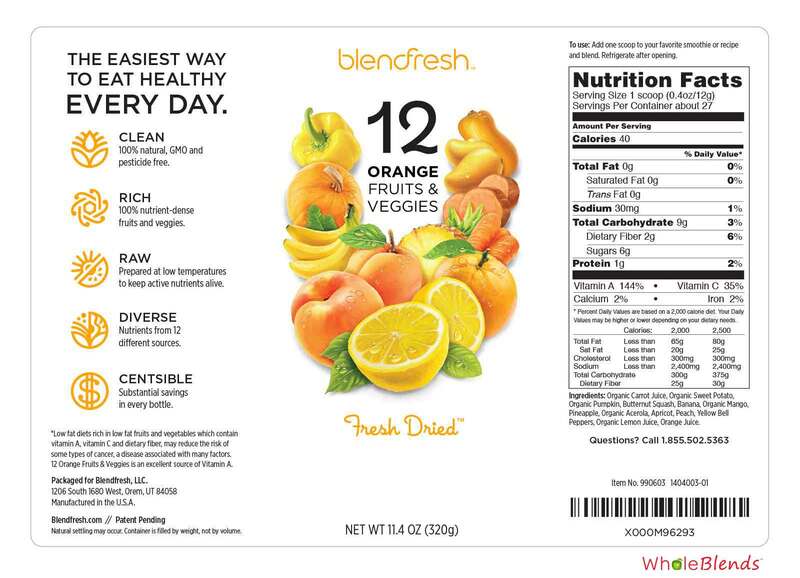 These blends are the closest you can get to fresh whole food, period. 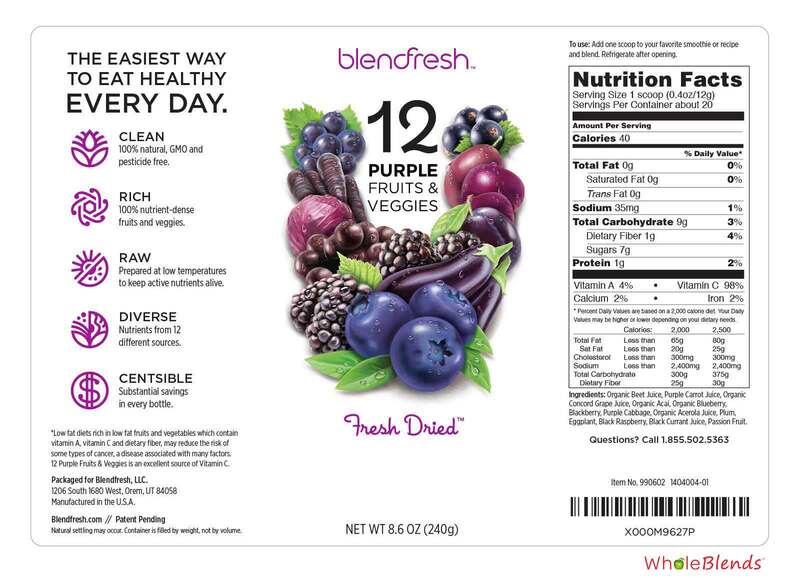 Each Blendfresh organic color blend includes at least 12 Fruits & Veggies. The formulated blends are combined by color to provide optimum nutritional profiles according to color benefits. Formulation was in part based upon the research and study of Dr. Daniel Nadeau published in his book The Color Code. 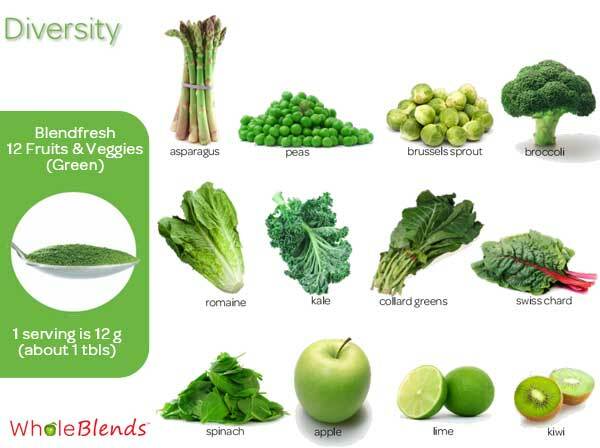 GREEN: It simply has never been so easy to Eat Your Greens! 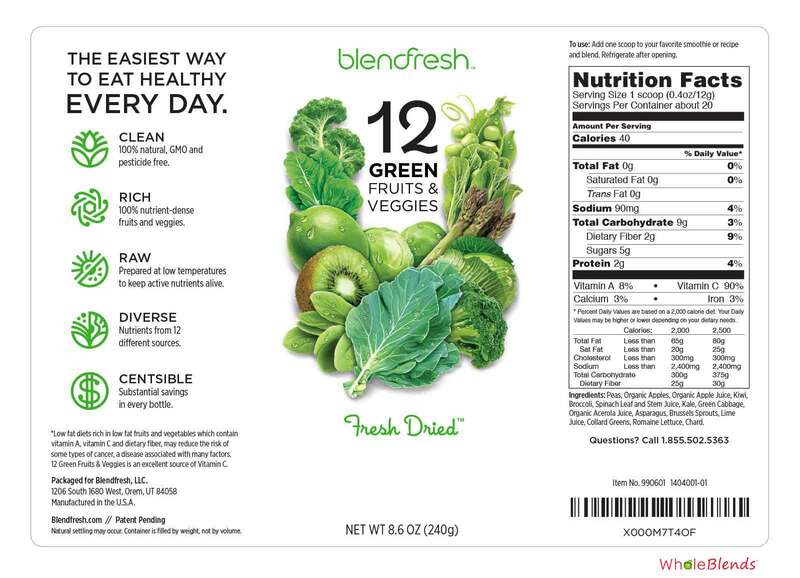 Blendfresh Green contains 12+ Fresh-Dried whole foods bursting with viable nutrients. 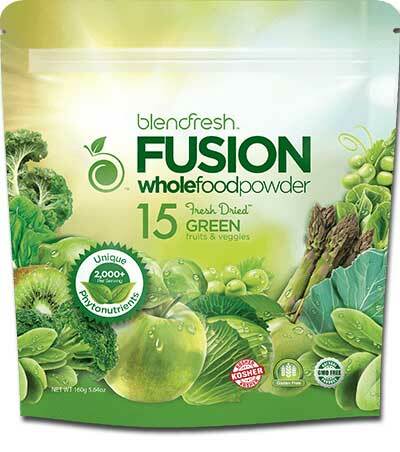 Every serving includes over 1700 potent phytonutrients including ferulic acid, apigenin, chloryphyll, zeaxanthin, lutein, alpha lipoic acid, and D-glucaric acid. It is the closest thing to fresh picked. When was the last time you or your child had a serving of asparagus, peas, brussels sprouts, broccoli, romaine lettuce, kale, collard greens, swiss chard, spinach, apple, lime, and kiwi in one meal? 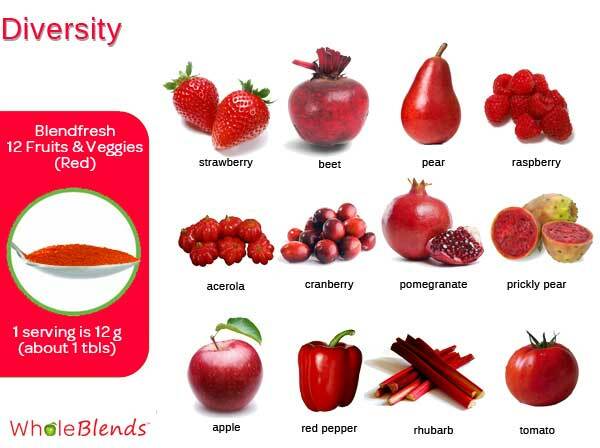 RED: Dark red whole produce for rich nutrition! 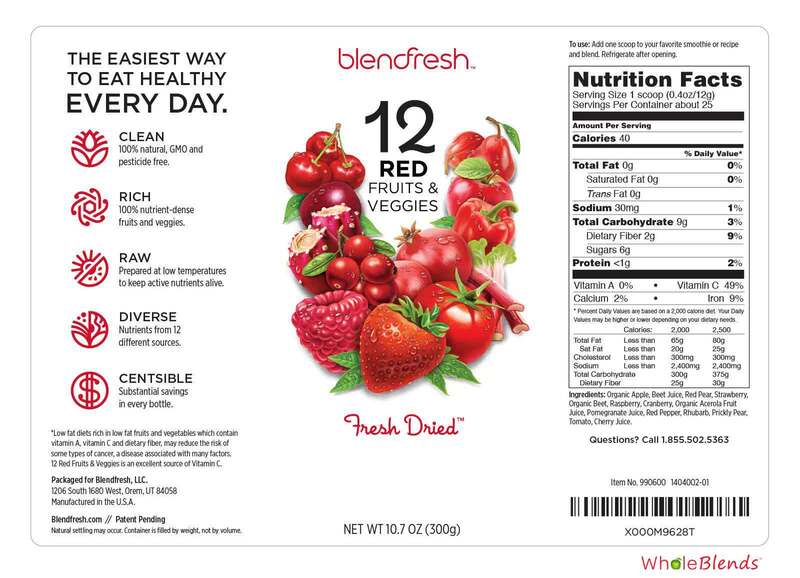 Blendfresh Red contains 12+ Fresh-Dried whole foods with a cornucopia of berries and other nutrition rich fruits and vegetables. Every ingredient has been carefully chosen to complete a dense nutrition profile including viable nutrients such as catechins, lycopene , tiliroside, kaempferol, flavonoid glycosides and ellagatannins. It is so simple to have delicious nutrient-dense meals. Each serving is bursting with nutrition from beet, strawberry, pear, raspberry, acerola, cranberry, pomegranate, prickly pear, red pepper, rhubarb, tomato, and apple. ORANGE: Nutrition from whole food the color of the life giving sun! 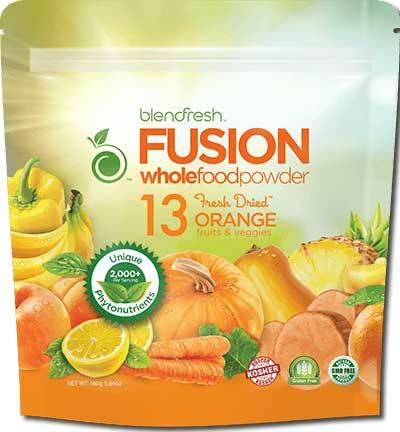 Blendfresh Orange provides the perfect combination of sweet and tangy flavors. Containing 12+ Fresh-Dried vegetables and fruits, Orange offers a healthy dose of potent phytonutrients including phytoene, mangiferine, syringic acid, gallic acid, gallotannins, peonidine, phenolalic acid and more. So much “good for you” has never tasted so delicious. 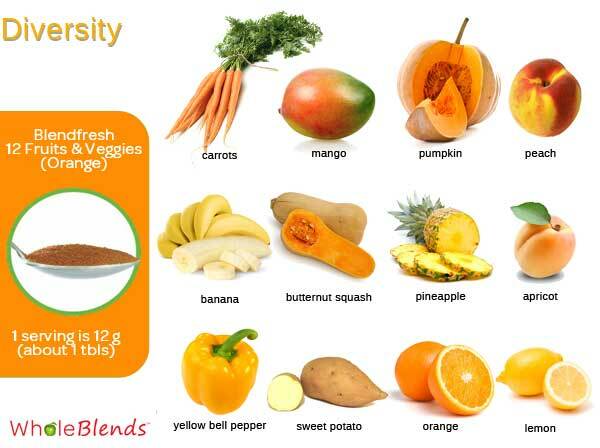 Imagine serving up a single dish with mango, carrot, pumpkin, peach, apricot, butternut squash, pineapple, yellow bell pepper, banana, sweet potato, orange, and lemon. 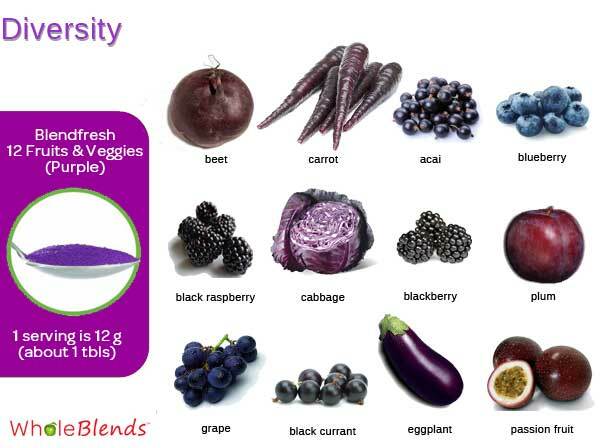 PURPLE: Deep colors of rich, diverse nutrition. 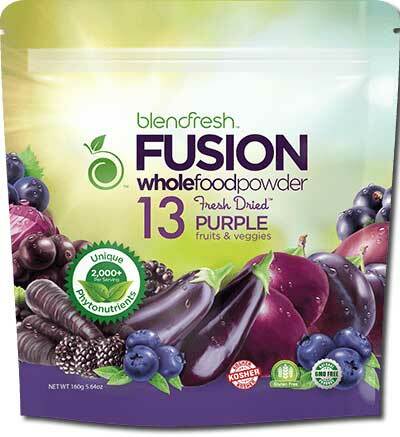 Blendfresh Purple is the power house of potent nutrients, antioxidants, and flavonoids. Made from 12 Fresh-Dried whole food fruits and veggies, this dark blend combines the beauty and benefits of a wide variety of seasonal produce. Serve up a bounty of purple carrot, acai, beet, blueberry, cabbage, blackberry, plum, black raspberry, grape, eggplant, black currant, and passion fruit any time of the year!